The mother of Deshawn Isabelle reportedly turned her son over to police after seeing these surveillance images. The mother of a 15-year-old boy who allegedly beat, sexually assaulted and robbed a woman on a Chicago subway train turned her son over to police after she saw surveillance photos of the attacker that had been captured on subway cameras. According to the Chicago Tribune, DeShawn Isabelle was on an empty subway car around 3 p.m. Monday when a 41-year-old woman boarded the train. DeShawn reportedly punched the woman in the head and then pulled her to the ground by her hair. Assistant State’s Attorney Joe DiBella told reporters at a press conference that the woman curled into the fetal position as, he said, DeShawn continued to punch the woman in the face and head. DeShawn allegedly took some $2,000 in cash from the woman, who was planning to wire the funds back to her family in Thailand, and reportedly spent the money on “junk food, Air Jordan track suits and his graduation fees,” DiBella said, according to the Tribune. DiBella alleged that during the assault, the middle school student put his hand inside the woman’s pants and sexually assaulted her. Once the train stopped, DeShawn reportedly boarded another train headed in the opposite direction, but not before he left with the woman’s iPhone and cash, according to DiBella. The woman, who suffered a concussion and bruises and cuts to her body, pressed the emergency button and was helped by Chicago Transit Authority personnel, the Tribune reported. DeShawn’s mother turned her son in regarding the attack after she saw the surveillance photos released by police. DiBella said that the teen issued a handwritten confession admitting to beating and robbing the woman, NBC Chicago reports. 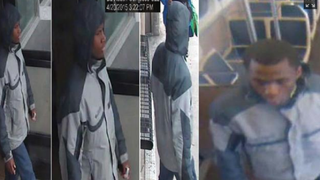 DiBella added that the teen’s fingerprints were found on the train window and that a search of DeShawn’s middle school turned up the jacket allegedly worn during the attack. DeShawn was being held on a $1 million bond and has been charged as an adult with aggravated sexual assault and robbery. Read more at the Chicago Tribune and NBC Chicago.